They stayed and set up the beds before they left. By then it stopped snowing, and the crisp air, and blanket of snow filed me with peace. I knew I had done the right thing. The boys and I actually went outside and ran through the snow. I began to feel like a whole different person, I think I even grew taller. That week I stopped to buy a routine thank you card at new age shop, and then I saw her"Aleta: High Priestess of the Dolphins" on a greeting card.. She seemed to embody an ultra feminine spirit, rising upward from the depth of the blue gray ocean. I felt like the mermaid Aleta, lifted up out of the darkness into the light. I purchased several packs of the card, and it became my trademark. For any occasion, but especially when someone needed to be lifted up, I sent them my favorite card. After I mailed out my last card, I went back to the shop to restock, and the shop was gone. Closed; out of business. Five years passed before I saw the painting of Aleta again. I was introduced to Aromatherapy in 1994. (See getting started under meet Diane for that story) By 1995, I was making my own products, and had begun intuitively blending mood enhancing formulas. When I finally got enough nerve to see if another shop would carry my products, I contacted Lavender Hearts, a local new age store. They said there were actually thinking of carrying aromatherapy and set up an appointment to meet with me. I was nervous as I entered their charming boutique; I stayed by the door for a while, hesitating. Then I saw her, Aleta: High priestess of the Dolphins, in a large poster! Lavender Hearts immediately agreed to carry my Aromatherapy Mystys, and I, of course, bought the poster. A few months later, during a major snowstorm, the moon reflected off the snow and sent light into my living room in a precise angle that illuminated the poster. That night I was inspired to make Dolphin Goddess. I picked up my favorite book, and it fell open to the page about Grapefruit essential oil; light, airy, fresh; said to lift one's emotions on wings. I started with grapefruit, to provide the experience of feeling raised up. Ylang Ylang brought the ultra feminine energy of the mermaid, and Bergamot, my all time favorite essential oil, emphasized the balancing power of the two Dolphins. Since then, many people have said that the sweet, delicate aroma reminds them of a gentle ocean breeze in summer. Naturally, I love it. Some of my friends joke that since my initials are DG, that I have the spirit of Dolphin Goddess. 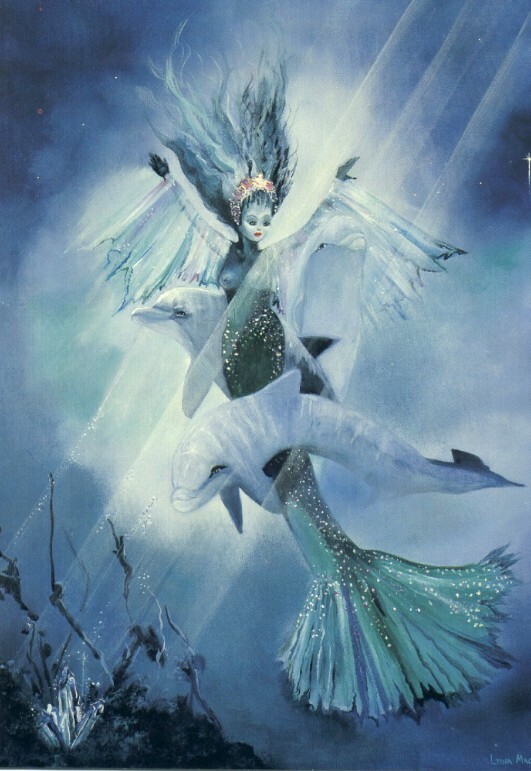 The actual title of the original oil painting by Lydia MacCarthy, published by Spirit Art, is "Aleta: High Priestess of the Dolphins", not Dolphin Goddess. A few days later, the priestly, masculine properties of Sandalwood came into my mind, along with the complete feminine energy of Bulgarian Rose. When I added them to the already luscious Dolphin Goddess, the final formula of Dolphin Priestess emerged. After all this time, reprints of the painting, in card or poster, are not available. Spirit Art Company is no longer in business, but we can still enjoy the aromatic spirit of Aleta, with Dolphin Goddess and Dolphin Priestess. In December of 1989 I left my husband. It was one of the most difficult things I ever did. I'm not saying that he was bad and I was good or anything close to that, but simply that whatever the circumstances, leaving a spouse is painful. Although I had found an apartment in October, it wasn't ready until December 8, so it was made worse by exiting right before Christmas. To top that off, it started snowing heavily, as I waited for the movers. The owner of the moving company called to tell me all his drivers quit for the day, so he couldn't move us. (My two young sons, Eric 10 and Joe 7, were going with me) I pleaded. "Please", if I don't go tonite I'm afraid I'll never go." He and his girlfriend moved us that snowy night; she was actually in high-heeled boots. They had just moved in together that week, felt an emotional connection to us, and decided to brave our steep snowy country road to move us across the county at 8 o'clock that evening.